Couleur camo coyote. administrative ou arrêt des transports, qui tendraient à retarder, empecher, rendre difficile l'exécution. Cas de force majeur. Annulation de commande . This is a very versatile scarf allowing many different ways to be worn. Black and White with a woven pattern design giving an authentic military look. Perfect for Airsoft & Paintball loadouts. 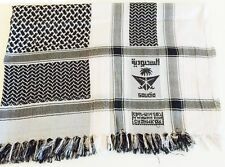 1 x Black & White Shemagh.